P REFACE The release of Tension and Strain of Work from the Body may be understood as a natural physical response to fatigue. Yet relaxation as a regulated right of human labour in the Western world emerged only in the nineteenth century, and ever since has been repeatedly checked by anxieties about Mass Leisure and by the dynamics of economic growth. Scientists began to understand the working body as a â&#x20AC;&#x2DC;Motorâ&#x20AC;&#x2122; with a measurable capacity for work and the need for regularly spaced rest. Work scientists like Angelo Mosso believed that output could be optimized if exhaustion was avoided. Overwork reduced longevity, decreased fertility, stunted the growth of youth, produced insomnia and nervousness , and encouraged Alcoholism and Lithargicness. Efficiency in the human motor required daily and weekly rest breaks and even regularly spaced rests within the workday . Since the 1970s, complex economic and social trends have reversed the historical trend toward increased leisure time. Space created for public use where people can enter for individual or public interests with- out social discrimination. If well organised, it will help to enhance cohesion of community life, positively change the public behaviour, and increase the community awareness, pro- mote individual identity and have a certain degree of local cultural meaning. Site Selection Application of the Hub ! INTRODUCTION Recreation or fun is the expenditure of time in a manner designed for therapeutic refreshment of oneâ&#x20AC;&#x2122;s body or mind. While leisure is more likely a form of entertainment or sleep, recreation is active for the participant but in a refreshing and diverting manner. A time in which individuals are not compelled to do anything, and are free to choose to relax or to take part in a leisure activity. Leisure has important social functions, including relief from the demands and restrictions of work. Most people enjoy socializing with friends for dinner or a drink after a hard day at work. For many young people, having a regular night out a week is a normal part of their free time, whether it is joining friends for a drink in a pub, dining out in a restaurant, watching a film, playing video games or dancing at a club. BASIC THOUGHT BEHIND SUCH A PROJECT : A multipurpose center for play and culture offers theater, music, and Leisure activities like Yoga, Meditation Aerobics Etc . A teen/Leisure center provides a safe and fun place to hang out. Outdoor spaces can be used asthetically as well as amusement , pathways(circulation) and peace of mind. An appropriate designed centre or a Hub would result in More Revenue Generation for the Government as well. AIMS AND OBJECTIVES 1. To understand the behavior pattern of users. 2. To find out the aspiration and desires of users. 3. To chalk out requirements considering the behavioral aspects along with functional aspects. 4. To identify the appropriate environment for individual activities. 5. To design a recreational club having all necessary requirements and to create an appropriate user movement. SCOPE The HUB is to be developed as a fun club comprising recreational along with the leisure facilities. The art and craft emporium with exhibition and workshops will be the one of the major attractions of the club. The catchment area of complex will include harmony in overall development. It includes both outer spaces and indoor spaces,ie spaces under built masses. (a) Require special facilities to cater for widespread public demand; and (b) Require land areas to be allocated in town plans. METHODOLOGY Every city has the power to generate a surplus of amenities. But we find that in bigger cities amenities are is inversely proportional to the true happiness of people. The lifestyle is forcely surrounded by in the form of congested trafficway,more congested apartments,population,noise etc. Under these circumstances ,to get rid off from tension there should be some provision of recreation where people of all the age groups come and enjoy the life in different ways and feel relaxed for sometime. Therefore there should be a provision of activities for all different age group people like swimming,tennis,gymnasium and sauna-bath for youngsters,billiards,cards,chess gathering space,auditorium for all age group,aquarium,sandmountain,slipping slides,see-saw etc. for children. Recreation club is a club, developed with a commitment to fun,relax,peace and fitness for the entire family and offers an immense range of activities. It can also be further explained as: -A centre as a social expression, community need, concentrates activities, meaningful spaces, a neighborhood focus and urban excitement. - The club provides a platform for interaction, relaxation and amusement. -It offers a junction for tourism, sports and cultural development. WHY A RECREATION HUB ? The undertaken Dissertation topic is a Community Recreational Hub that supports social, cultural, physical, and entertainment activities for all ages, indoors and out. BUILT MASSES AND FUNCTIONAL COMPONENTS (a) SPORTS CENTRE (b) LEISURE CENTRE : Leisure Centres are intended as venues for family leisure. It is a facility proposed for development in the urban areas and the New Towns as an alternative to Sports Centre. It should not, however, replace the additional Sports Centre which is required for provision in the employment districts. A wider range of recreation activities beyond core activities such as bowling green, children’s playroom, indoor golf, rock climbing, leisure pools, coffee corners and restaurants are provided. (c) HOTEL : As business and leisure travel become more intertwined, today’s hotels must accommodate the overlapping desires and needs of the traveler. Hotels need to provide more things to more people—a place to work,relax,gather, entertain the family, eat, drink and shop. Modems, computers, wireless phone and fax machine are becoming room standards while entertainment expectations are now greater than just a tennis court or indoor pool. The convergence of the themed hotel has brought increased competition to the hotel industry. (d) RESTAURANT/DINER : A place where people pay to sit and eat meals that are cooked and served on the premises. A diner is a prefabricated fast food restaurant building characteristic of American life, especially in New Jersey, Pennsylvania, New York, as well as in the Midwest, although examples can be found throughout the United States, Canada, and parts of Western Europe. Diners are characterized by offering a wide range of foods ,a distinct exterior structure, a casual atmosphere, a counter, and late operating hours . NON CORE ACTIVITIES Non-core activities are specialist types of recreation which have lower demand. They include such activities as golfing, horse-riding, wall climbing and mountain biking. The provision of facilities for non-core activities should be guided by demographic trends and the availability of suitable sites. There are no planning standards and guidelines for the provision of non-core activities. Nonetheless, the provision of a wide variety of recreation facilities apart from the core activities is encouraged by the Government. Proposals for such developments should be assessed on their individual merits. The Core Subject of Matter in the Hub? The Core part that has to be kept in mind in this Recreational Hub is the MOVEMENT OF THE USERS. USER MOVEMENT Act or process of moving from one place to another. It can be directional, irregular or multidirectional. Need and availability at different levels is the main cause of movement. The various spaces interlinked within the building are approached through this movement. Movement is related to energy, so to conserve energy there must be deliberate effort to arrange the various interlinking spaces, to achieve minimum movement. The designing of recreation club is not merely a combination of spaces on the basis of function. It is much more than that. The designing depends on behavior pattern, psychological aspects as to how people move, how they visualize things, the degree of privacy they require and much more. CLASSIFICATION : The classification of activities is done with respect to the activities held inside the main building i.e., Internal and the activities to be held outside the main building i.e.,External. The further classification of internal activities is done as the activities performed by and activities performed by the young / adult people, who is again parted as the activities for males and activities for females. This classification is also same for the external activities, which is fractioned among kids and young people and is further parted between males and females. DATA PRESENTATION(ANTHROPOMETRIC DATA) Recreational Buildings These Buildings should be functionally designed to make possible a varied program of activities for all ages. These buildings should be designed and dedicated to meet the needs of all people in their respective neighbourhoods and communities . Recreation buildings should provide a safe, healthful, and attractive atmosphere in which every person in the community or neighbourhood has the opportunity to enjoy his leisure by participation in activities of a social, creative, cultural, or physical nature. Almost without exception, recreation areas require some type of structure which will fulfill program needs and yet blend aesthetically into its surroundings . In terms of function, build- ing types may range from the simple picnic shelter to the complex community recreation building with its variety of special service facilities . Such buildings may vary in design from the rustic, depicting the style of early colonial days, to the contemporary, representing the most modern architectural concepts . In many neighbourhoods and communities, school facilities are adequately equipped to provide recreation programs for youth, but other existing age groups are not always served. In such instances, the community must depend upon public recreation facilities which are planned and operated independently to accommodate a recreation program for the total community. DATA PRESENTATION(ANTHROPOMETRIC DATA) Classification of Recreational Centres: Growth in the scope and complexity of the recreation program has created a need for buildings which will provide facilities adapted for a wide variety of recreation activities . Unlike many of the early structures, present-day buildings provide for adaptability and mul- tiple use. This change from the simple to the complex has stimulated the development of a variety of recreation buildings. These are classified by function and then categorized by size. The standards used for de- termining the size requirements of recreation buildings are usually based upon a square- footage-to-population ratio. This is the most common type and can be used in any city or community. It is believed by many recreation experts that the most efficiently operated building is the one designed to accommodate a neighbourhood or area of approximately 8,000 persons. This building encloses 10,000 to 20,000 sq ft and includes basically the same facilities as the Type 1 structure. DATA PRESENTATION(ANTHROPOMETRIC DATA) Community Recreational Building: The community recreation building functions beyond the primary purpose of serving a sin- gle neighbourhood. It is designed to offer a more diversified program in order to meet the complete recreational needs of all people in the community. The community building is normally larger than a neighbourhood building and is usually located in a major recreation area such as a community park or playing field. Multipurpose Room The multipurpose room should be designed to accommodate such activities as general meetings, social recreation, active table games, dancing, dramatics, orchestra practice, concerts, and banquets . The area of this room should be approximately 2,000 to 3,000 sq ft . It should be rectangular in shape with a minimum width of 40 ft . The minimum ceiling height should be at least 16 ft . The floor should have a nonskid surface to prevent many common accidents. The floor should also be level in order to permit multiple use for meetings, dancing, dramatic presentations, etc. Stage A stage and related facilities are frequently included in a community centre. They may be built in conjunction with the multipurpose room or, preferably, as a separate unit . The stage proper should be about 20 ft in depth, and the proscenium opening should be at least two-thirds the width of the room . It is desirable that the approach to the stage from the floor of the main room be by inclined ramp with a nonskid surface to facilitate the physi- cally disabled and aging and to accommodate the movement of equipment. Consideration might be given to the construction of an outdoor stage contiguous to the multipurpose room. It is desirable that the room be equipped with a modern public-address system, permanently installed with matched speakers and with outlets for additional micro- phones and phonographic equipment. Consideration should be given to a master control from the office of the building . All stage lighting should be modern and should be con- trolled from a dimmer control cabinet equipped with a rheostat . Provisions should also be made for television installation . Lounge and Lobby The lobby of the community recreation building is the space just inside the entrance. The lounge should open off the lobby, and, if possible, should be close to the central office and to the multipurpose room and/or social hall-gymnasium. The lounge and lobby are often combined into one room. When they are combined, it is suggested that the size of the lobby-lounge be about 600 to 800 sq ft. The office, club rooms, game room, and rest rooms are usually adjacent to the lobby- lounge . The entrance doors of the lobby present a problem from the standpoints of aes- thetics, safety, security, and vandalism. Solid glass panels-from ceiling to floor-and solid glass doors are quite popular and attractive. Table tennis is 0.76m. high and normally requires a space 1.4 x1.6*0.5m. for storage. When in use each table requires individual lighting. Size and dimension : Size of playing space 7.6 x 4.6m. Ceiling height is 4.2m. minimum Clearheight below light is 2.7m. Recommended area : Ground space is 643 sqm (minimum)to edge of pavement. Size and dimension : Court size is 10.97*23.77m with to 6.4m. Clearance on shorter side to 3.66m. on longer side of court. Height of court for recreational purpose is 0.8m. Orientation : Preferred orientation is for long axis to be North-south. The billiards control council has introduced with world wise agreement.3.50*1.75m. table, which specify for the first time the actual playing area within the cushion face. The present table specified over the frame remain acceptable. Size and dimension : Size of playing space 5.3*7.1m. For singles table and for doubles ,table hall size is 7.5*8.7m. when in use each table requires vidual Lighting. In basketball, the basketball court is the playing surface, consisting of a rectangular floor with tiles at either end. In professional or organized basketball, especially when played indoors, it is usually made out of a wood, often maple, and highly polished. The baskets are always 10 feet (3.0 m) above the floor (except possibly in youth competition). Basketball courts have a three-point arc at both baskets In general a basketball court should have a minimum clearance of 25 feet (7.7m), although a ceiling height of at least 27 feet (8.23m) is recommended. A volleyball court is 18 m (59 ft) long and 9 m (29.5 ft) wide, divided into 9 m × 9 m halves by a onemeter (40-inch) wide net. The top of the net is 2.43 m (8 ft 0 in) above the center of the court for men’s competition, and 2.24 m (7 ft 4 in) for women’s competition, varied for veterans and junior competitions. The minimum height clearance for indoor volleyball courts is 7 m (23 ft), although a clearance of 8 m (26 ft) is recommended. A line 3 m (9.84 ft) from and parallel to the net is considered the “attack line”. This “3 meter” (or “10-foot”) line divides the court into “back row” and “front row” areas (also back court and front court). These are in turn divided into 3 areas each: these are numbered as follows, starting from area “1”, which is the position of the serving player. Restaurant should be planned so that variety of seatingarrangements can be achieved. Table size will influenced by patron comfort and efficient utilization of space.The present standard height of table is mostly about 760mm with chair seat height of455 to 460mm. General thumb rule for deciding the area of restaurant per seat in sq. feet- Tableservice club restaurant (15 to 18 sq.ft./person) In table service dinning room has been estimated as 20% of total capacity.cafetarias from 12 to 18%. Restaurant & bar are parted with a glass partition wall. CapacityRestaurant â&#x20AC;&#x201C; 70 Bar - 24 Conference hall accommodates population of about 70 person and comprises two doors, one forentry and the other for exit. Players Rooms: Four Players rooms are situated on the second floor, and another 8 rooms will be added soon. Each room has twin beds, is air-conditioned and has an attached bath & toilet. This is available to any guests of members as well as members of outstation affiliate. Table Tennis unit houses 5 tables in a spacious layout. Special flooring helps budding players toenjoy a comfortable game of TT. Canteen - Canteen facility is situated adjacent to the Gymnasium and caters tasty snacks andbeverages all day long, from 7 am to 9 pm. Gymnasium - A professionally managed healthcentre with modern equipments and apparatus provide an excellent opportunity to tone your bodywith regular weight loss programmes and personal trainers on request. Administrative Block This block comprises of cricket pavillion and governing office The cricket pavilion is having rooms for home and guest team and also an umpireâ&#x20AC;&#x2122;s room. Some other facilities like store n changing rooms are also provided Office is located at the first floor of the building,it is the oldest structure of the complex. Offer 11 tennis courts out of which 7 are asphalt base - synthetic surface courts and the remaining 4 are sand courts. Floodlight arrangements for 3 synthetic courts is an exclusive facility at DG. Deccan Gymkhana is a recognized venue for tournaments conducted by the International TennisFederation. Offer four asphalt base - synthetic surface basketball courts (outdoor) Floodlight facility is available for three courts. Deccan Gymkhana is a recognized venue for tournaments conducted by the International TennisFederation. Offer four asphalt base - synthetic surface basketball courts (outdoor) Floodlight facility is available for three courts. Lush green playfield is the pride of Deccan Gymkhana, suitable for playing First Class cricketmatches. A regularly maintained ground with more than 12 sporting pitches help us offer good playingconditions for cricket lovers. A pop-up sprinkler system, movable sight screens and other facilities make the participants feel comfortable. Jogging Track: A specially designed and landscaped Jogging and Walking track of 450 meters on the peripheryof the cricket ground has be created for all members to enjoy any time during the day. It has beenfitted with flood lights to enable use up to 9 pm. JOGGING TRACK Volley Ball: Offers two clay courts (outdoor) with floodlight facility for volleyball aspirants Swimming pool: The Deccan Gymkhana swimming complex, popularly known as Tilak Tank Three separate pools offer an excellent opportunity for a dip. The main pool (50 M X 21 M) conforms to the norms laid for conducting National tournaments and is equipped with a modern filtration plant to make sure crystal clear water is made available to swimmers. Arrangements to retain the underlying streams for those who love to swim in natural water. Aqua-aerobics and Water polo are other activities which are regularly conducted at our pool. Peak time â&#x20AC;&#x201C; 4.00 pm to 9.00 pm Peak Days â&#x20AC;&#x201C; Thursday, Saturday, Sunday including holidays Population (General)- 400Population (Maximum) - 2500Merits A good variety of indoor and outdoor games are available. A variety of tennis court is available, a player can chose as per his liking. Extra sit-out is provided by the side of card room, so that the player can enjoy playing in natural environment. 1.5 m wide jogging path is provided around the boundary of the cricket ground. Merits -A good variety of indoor and outdoor games are available. -A variety of tennis court is available, a player can chose as per his liking. -Extra sit-out is provided by the side of card room, so that the player can enjoy playing in natural environment. -1.5 m wide jogging path is provided around the boundary of the cricket ground. -The old structures of the complex are still maintained and seen as the heritage of the gymkhana. -Standard size pools are provided which makes them to organize national level competition. Demerits -Administration block is situated at quite a distance from the entrance gate to the complex. -Insufficient parking facility. -Bar and restaurant are provided at the same place and are having glass partition in between them.-Insufficient rooms are available for lodging. -There was no seating arrangement for the spectators in the billiard room. -The swimming pool of the gymkhana is located at some other place from this site. Main Indoor Block Basement â&#x20AC;&#x201C; for parking 2 wheelers and 4 wheelers. -accommodate approx 70 cars The entrance for the 4- wheelers is from the rear of the building to the basement and the exit is from the front. Ground Floor â&#x20AC;&#x201C; At the entrance of the building, there is an atrium having reception and waiting. Moving further is the canteen along with the seating of about 100 persons. It is made doubleheighted. A community hall is located at the far end of the floor having accapacity of 300 person. First Floor - Bar , Restaurant and administration wing. There was glass partition between bar and restaurant. Clear vision to the canteen from bar and restaurant. Third and fourth Floor 32 well appointed AC rooms on the third and fourth floors. Large, spacious well lit lounge with a cafeteria overlooking the cricket ground, the tennis and the Basketball COURT. Terrace Half Olympic size swimming pool and a Baby pool. Steam bath and changing rooms along with the lockers are provided The vast open space on the terrace used to organise parties GYMNASIUM BLOCK This block is located near the rear entrance to the complex It is the common gym for males and females It is an old structure which was built for some other purpose but now it is used as fitness centre. It has managed with all the modern equipments. Ladies Block The Gymkhana had boast of a separate Ladiesâ&#x20AC;&#x2122; Wing. It has earmarked separate areas for the Ladies, which includes its own library and offices apart from halls for the Ladies Club sports and cultural activities. It provides a level of comfort to ladies to have a get together and social meetings among themselves, without the interference of gents member of the gymkhana They can enjoy the view of cricket, basket ball and lawn tennis from their place. Outdoor Recreational Activities Lawn Tennis â&#x20AC;&#x201C; The Lawn Tennis court is also located at the rear of the ladies block. There are three tennis courts with sand finish. The cricket ground will be redone with standard Green Top draining and irrigation facilities with aseparate pavilion and dressing rooms for both the teams along with a viewing gallery. Jogging path is also provided around the boundary of the ground. Cricket Stadium Basket Ball Located near the Ladies Block.Two basket ball courts are provided, with the seating arrangement for the spectators. Floodlight facility is also available to use the court in the night hours also. Demerits -Administration block is situated at quite a distance from the entrance gate to the complex. -Insufficient parking facility -Bar and restaurant are provided at the same place and are having glass partition in betweenthem.--Lack of maintenance of the courts of outdoor sports. -The party hall is having only a single entrance and also there is lack of source of ventilation. -Ladies activity block is located at far distance from the entrance gate of the complex. INFERENCE FROM THE CASE STUDIES -All the above requirement will be taken into consideration. -The different blocks within the complex will be so placed, so that the visitor have to cover theminimum distance. -The spaces within the building will be arranged in a way so at multitude, the spaces are linkedand can be used together as a whole. -All the sport courts will be made in accordance with the standard dimensions. -Separate block will be provided for ladies. Lodging facility will be provided as per the design. -Flexibility of spaces – a big auditorium is parted using partition wall to make separate halls. Location: The proposed site is located on VIP State,Raipur Situation :- The situation shows the position of the site in relation to it’s surroundings. The advantages of site lies at it is at the centre of Raipur city and new Raipur,considering the future scope. The road approaching the site is a national highway, this is also veryadvantageous for the site. As in this zone, the network of transportation and communication isvery developed. Recommendation Functional and aesthetic design consideration have to respect well motivated requirement of production. Approach behind a recreational club is well connected with the area which it wants to serve and is easily approachable. The site should be free from noise so that person feel relax. Thus an aesthetically designed building with neat and pollution free atmosphere and well connected site with sufficient capacity are of the important factor which enter into the archietectâ&#x20AC;&#x2122;s concept of the Recreational Hub. Advance Studies Landscape A club building is very different from other buildings in the sense that it does not offer any functional service in the prevalent sense of the word. What it offers instead is a sense of joy fitness and well being. One has to plan experience and expections while planning a club building. While planning the user psychological state. One cannot stop with a small area called the built mass that is the building, for it consists only a part of the whole experience of the user. The planning has then to be extended to the whole site area. 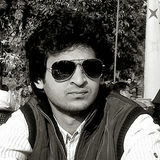 Further Indian climate is suitable for outdoor planning. The HUB has more attendance during evenings and members have a tendancy to enjoy outdoor surroundings. That is why has given specific stress in landscape detailing and tried to integrate it with the built mass as far as possible. Design The reason for choosing design as a topic of advanced studies arise from the same philosophy that only provision of any facility is not sufficient while planning a club building. What is more important instead of what type of atmosphere that activity and the area assigned to it produces. Though the placement of various areas had already explored this aspect of visual connection between two areas nevertheless while designing the interior,aesthetical considerations are the sole deciding factors. # PROPOSALS: -Interior of RestaurantThe following guideline are followed to make environment of restaurant make delightful and purposeful: I. Every table gives a close view of either dancing floor or outside surroundings. II. French window increases the visual area and brings nature more closer. III. Artificial and natural plants are given in the restaurant to create the inter-penetration of nature inside the hall. IV. To create a royal impression of restaurant by providing innovative artistic features, colour,texture and lighting. V. Contrast colour is used insight the restaurant to create dramatic effect. VI. Smooth texture is used by large size of glazed opening and plain plastering with combination of cool and hot colours. Landscaping of childrenâ&#x20AC;&#x2122;s playgroundAll equipment should contribute to the healthy growth and recreational enjoyment of the child, so that he learns to coordinate, cooperate, compete, create, enjoy and acquire confidence, playing equipment shouldI.Develop strength ability, coordination, balance and courage. II. Stimulate the child to learn social skills of sharing and playing with others and to compete in WWa spirit of fair play. III. Encourage each child to be creative and have play experience which are meaningful to him. IV. Assist the child in making the transition from playsuit to playground. FINAL CONCLUSION Beginning with the selection of the subject and theme and later, selection of the appropriate site the project involves working out the challenges and problems to be dealt with in a logical manner. 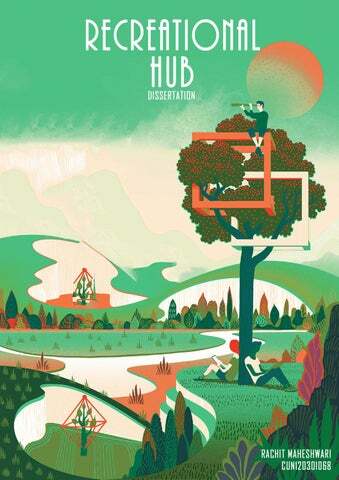 In this project, the major challenge was to work out the modalities of the Hub with its essential amenities, their functional and location significance after conducting the relevant literature and case studies and to integrate the project development with the essence of the theme to make the Hub a dynamic platform for wholesome social activity without tempering with the traditional purpose. A Recreational Hub is meant for public enjoyment and relaxation. Recreational Hub proposed is supposed to be a tool to entertain the members and visitors. Great care should be taken regarding each and every aspects. Also the choice of material used for both external and internal finishers should be taken care of. The Hub should be designed on the theme of openness. Great attention has to be taken to the needs of those who will come to the club as well as those who will work in it terms of their physical and psychological well being. An undergraduate B.arch program dissertation topic - "Recreational Hub"